ILAS field is operated by ILAS on the basis of a lease from the White family. The grass runway is oriented 36/18 and is 750m X 20m. There is a clubhouse at the field where the kettle is never far from the boil. The field carries ICAO designation EIIF. ILAS host approximately three fly-ins per year at EIIF. You can find details of upcoming fly-ins at EIIF here. 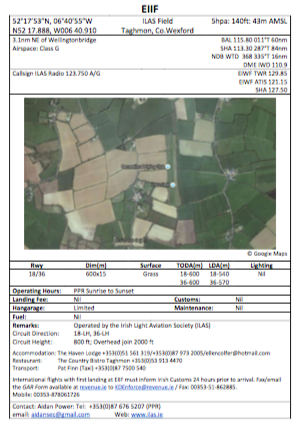 Wexford Flying Club (formerly Recreational Flying Club) operate a Registered Flying School as sub-tenants of ILAS and offer 'ab initio' training in their Motorfalke. Contact Peter Tawse on training@ilas.ie or through the WFC's Facebook page. The Rollason Condor EI-BDX is also based at the field and is available to ILAS members for training, maintaining currency or simply for the fun and experience of flying such an enigmatic aircraft. Further details are available here. Independently of ILAS, a group of members lease a large building at the field for use as a hangar. Six aircraft are currently based at the field, including ILAS's own Condor and the WFC Motorfalke. An airfield information sheet is available here.